Formulated to give you sinus support & wellness every day of the year. Learn how Sinus Support™ can keep you feeling alive! Sinus Support™ will keep your sinuses happy and healthy year round. Pollution, allergens and dry air can all irritate the sinuses to the point where they swell shut. Now there is something natural that you can do to support sinus health every day of the year. Sinus Support combines just the right amount of herbs to soothe and aid the restoring of healthy sinuses with a normal saline and aloe vera spray. This combination helps to relax sinuses, moisturizes then in the worst of environments. You nose deserves to be pampered everyday! This spray is safe to use every day for moisturizing, soothing and restoring dry irritated sinuses. Carry it in your pocket to moisturize your sinuses all day long. Don’t just blow your nose, soooooothe your nose. Sinus Support is so much more than a saline spray; you’ll never go back. 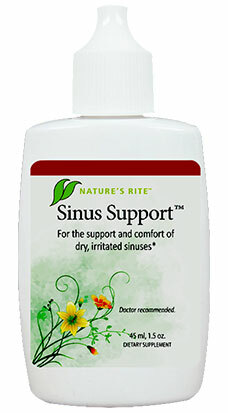 You can order a bottle of Sinus Support™ and be on your way!